Easter basket designed with your little guy in mind. This basket makes a perfect Easter basket for boys. After all what little boy do you know that wants to get an Easter basket that is pink or has a pink bunny in it ? This basket is filled with blue items. 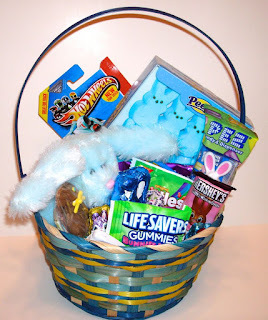 Blue basket, blue bunny, blue peeps. There will be no doubt that it was intended for a little boy. You get a variety of candy and toys to keep him busy for hours. An Easter theme card game. You get over 20 candies plus 4 toys picked out just for boys. You won't go wrong when you buy one of our Easter basket for boys. Have it delivered right to your door, with a personalized gift message. We have many other Easter Baskets to choose from that will delight anyone on your Easter list.